Folks: I posted the interior cab photos provided by Gary Farkash (OBRM). I tried to label them, but could the expertise of others. Thanks. http://www.trainsarefun.com/lirr/lirrex ... ralist.htm First item after the conottents list. There's something very ironic about the builder plate in the DE/DM30 cab. 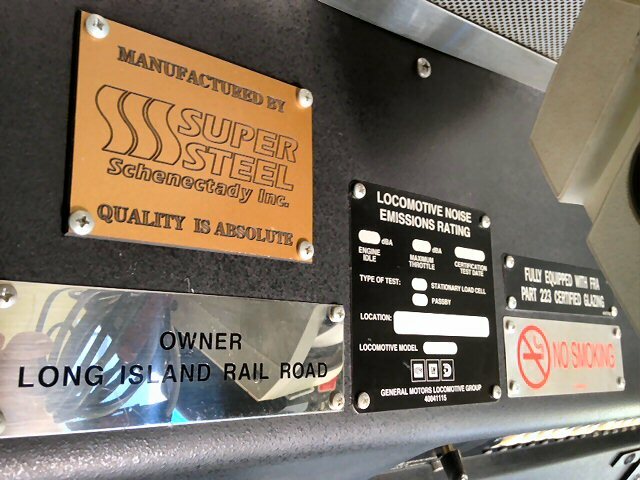 Super Steel built the Carbody,should have "rebuilder's" plate from then CR Altoona Shop. Super Steel turned into a "Fly by night" failure,quality = ZERO. nyandw wrote: Folks: I posted the interior cab photos provided by Gary Farkash (OBRM). I labeled them, but could use the expertise of others. Thank you. http://www.trainsarefun.com/lirr/lirrex ... ralist.htm First item after below the Contents listing. Should leave the builder's plate. Those who forget the past are doomed to repeat it! I think that (Super Steel) was created because the work had to be performed in NYS as per the engine contract?